Reyna Sparks is a senior at Illinois State University and is the president of the Student Wellness Ambassador Team (SWAT), a student organization under the advisement of Health Promotion and Wellness. 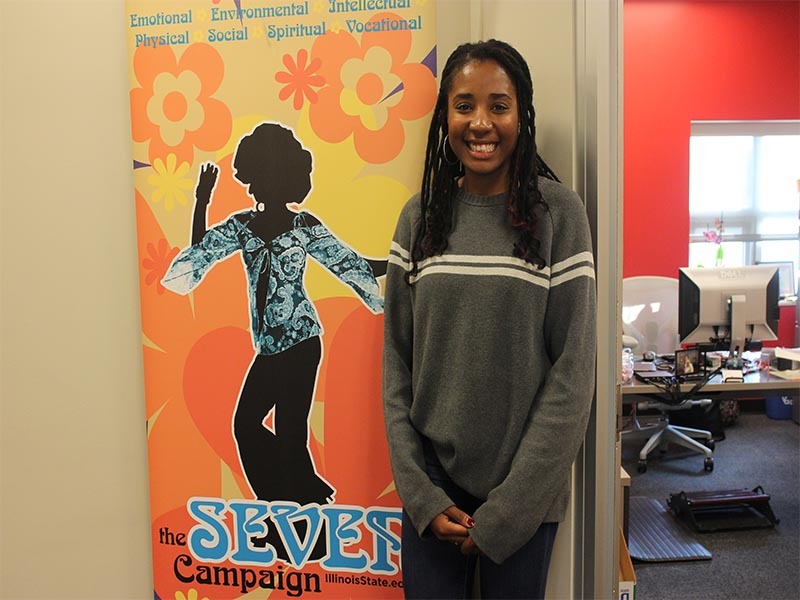 SWAT focuses on promoting healthy behaviors and lifestyles to students on campus through a various outreach programs, such as educational workshops, special projects, and staffing the G Spot portable wellness gazebo. Making a difference with SWAT. Sparks has displayed a servant leadership approach to her role in SWAT and has gained many benefits she can carry into her future. Members of SWAT and the student population they serve are the beneficiaries of Sparks’ commitment. Sparks’ words of wisdom are “Put yourself out there!” It was through Sparks’ decision to put herself out there that shaped her academic focus, who she is today, and what she will bring to the world tomorrow! If you are interested in getting yourself out there with SWAT, or simply visiting the G Spot you can visit the SWAT webpage or the G Spot webpage for more information.